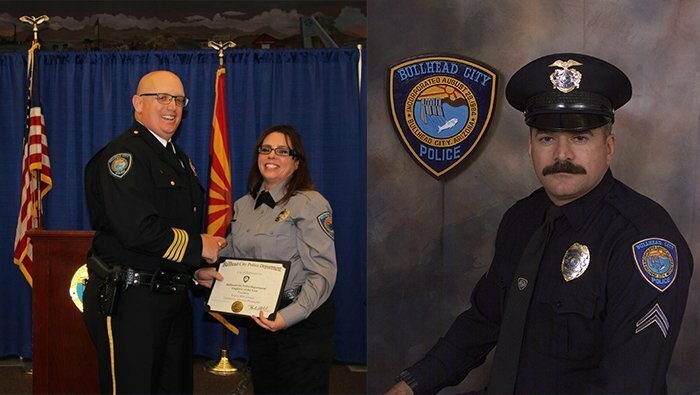 BULLHEAD CITY-–The Bullhead City Police Department recognized police officers and civilian employees at an annual awards ceremony that honors those who have contributed in a special way to help others and improve public safety. Corporal Bruce Greisen was named Police Officer of the Year and Emergency Services Dispatcher Angie McCullough was named Civilian Employee of the Year during the 2018 Annual Awards Program. Corporal Greisen began his career with the Bullhead City Police Department in 1990. He was promoted to the rank of Corporal in 1998. He served in the United States Marine Corps as a military police officer from 1986 to 1989. Corporal Greisen is also a Range Master and a sniper on the SWAT Team. Angie McCullough has been an Emergency Services Dispatcher since 1994. She began her career with the Bullhead City Police Department as a dispatcher in 2004 and served for four years. She returned again in 2016. Angie was recently certified as a Communications Training Officer and was assigned to the Tactical Response Unit as a Communications Specialist.